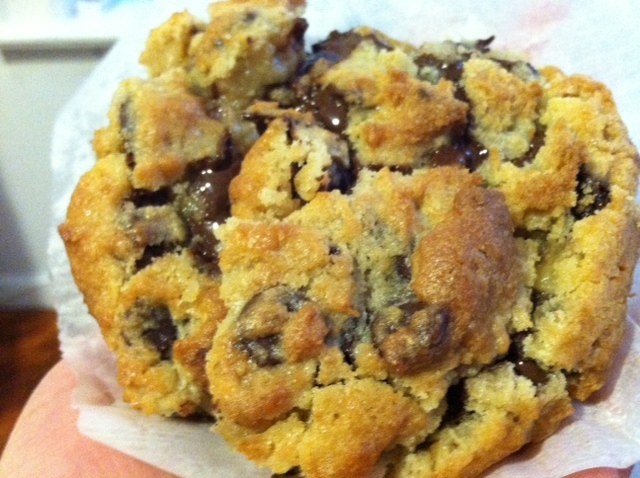 Chocolate Chip Cookies, Levain Bakery, Manhattan | Parlez-Vous Loco? Levian feels like such a New York given that I almost didn’t write about it. Yet still, I come across native and long-time New Yorkers all the time who’ve never had a Levain cookie. And when I meet them, I think to myself DEAR GOD, you have missed out on life. Actually, I envy those people the ability to get through their days without having these cookies constantly pop up in their heads. Because once you have one, you’ll never forget it. You’ll constantly be scheming up plans that take you near W. 74th on the Upper West Side. Located conveniently near The Dakota and Central Park (for all you tourists), Levain is more than just a cookie shop: it’s a bakery too. But I have to confess that I’ve only had two things there: one of their four varieties of cookies and a baguette only available in the mornings that comes pre-spread with rich, creamy butter and grape jam. I can’t vouch for the taste of the baguette, butter, or jam individually, but smushed together like that, they make just about the perfect baguette breakfast. But back to the cookies. 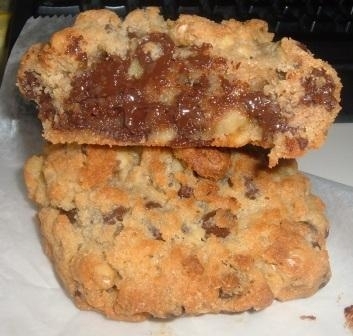 There are four kinds: chocolate chip walnut, chocolate chocolate chip, peanut butter chocolate chip, and oatmeal. Save your money and skip the oatmeal—it’s just a bland butter bomb, and that’s not just because I’m a chocolate person. It just lacks the punch and the je ne sais quoi of the others. Your gateway cookie should be the chocolate chip walnut, but the choc/choc and the peanut butter are definitely not to be missed. Their consistencies are different from the chocolate chip walnut: think of the delicious perfection of a not-quite-done brownie, just a tiny bit gooey-soft in the middle. That’s your chocolate chocolate chip and chocolate peanut butter. For better or worse (“worse” being me walking twice around Central Park one day to try and work one cookie off), I’ve made it my mission to taste chocolate chip cookies all over the world. And Levain’s cookies are hands down without a doubt the absolute best I’ve ever had. Don’t be dumb, readers … get you some.